The very low water levels continued to impact on the angling on the River Moy. Yet, some fisheries saw some good catches. The Moy Fishery produced a total of 35 fish for the week with 11 of them caught on the Ridge Pool. William Millar, Northern Ireland, was particularly successful catching 3 grilse between 3 lbs. and 7.5 lbs. all on fly. Also on the Ridge Pool, Tony Lyness, Co. Meath, had a nice 7.5 lbs. fish also on fly. UK flyangler, John Chapman, scored on the Weir Pool catching 3 grilse (one released) best at 5.5 lbs. Tony Lyness, Co. Meath, with his 7.5 lbs. Ridge Pool fish. 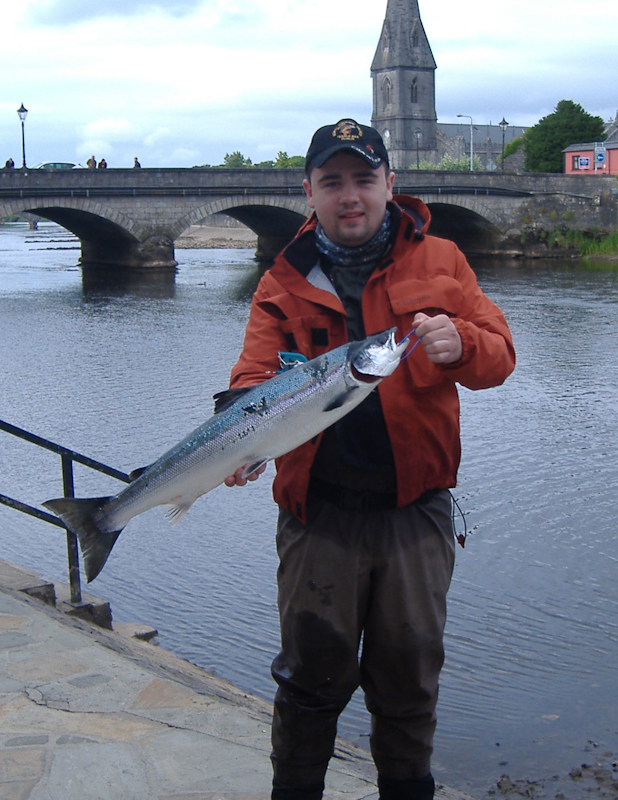 Peter Marshall, Northern Ireland, had a nine pounder on Gannon's fishing worm, while Jean Marie Bluet, France, caught two grilse on fly on the Foxford Fishery. The Foxford Club waters produced 61 fish for the week including three grilse for French visitor, Joel Guillou on bubble & fly. A happy Joel Guillou from France with his three River Moy grilse. Further upriver on Cloongee, Mark Hourigan, UK, had a cracking 14 lbs. fish on bubble & fly, while Jean Jaques Daurat, France, landed 3 grilse averaging 4.75 lbs. also on bubble & fly. Flyfishing proved to be successful at East Mayo with Gunter Profanter from Austria catching 2 grilse, best at 5lbs. and Frank Legout, France, landing an eight pounder. Judd Ruane reported that the excellent sea trout fishing on the Moy Estuary continued for another week. There are still plenty good fish between 2 lbs. and 3 lbs. being caught with a big run of well-conditioned smaller fish also observed. Fishing sand eel and mackerel strip seemed to be the most productive method. Amongst the successful anglers on "Pegasus" were Adrian O'Gorman, Dr. Danny Delargy and Alan Mansfield from the UK. 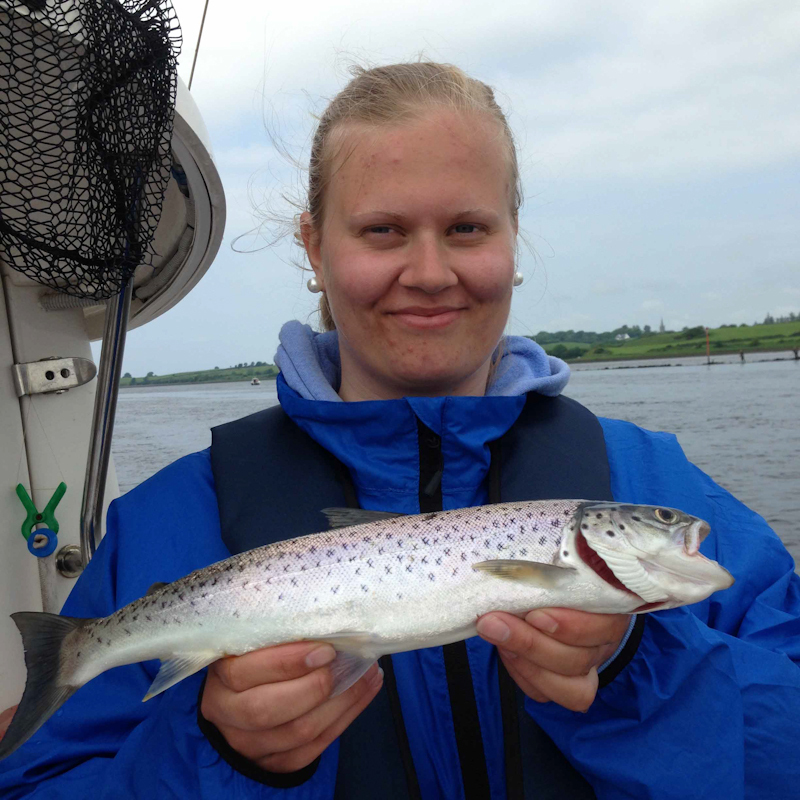 Norwegian visitor, Marie Rangjord, also enjoyed fishing on "Pegasus" catching 6 sea trout with her first seven casts. 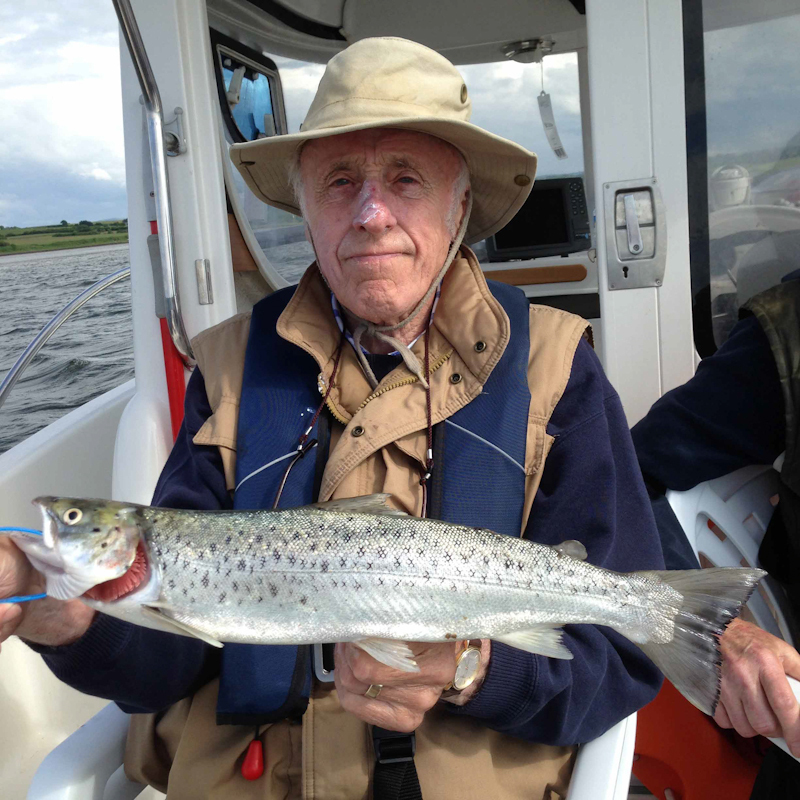 Dr. Danny Delargy shows a fine sea trout on "Pegasus". Marie Rangjord, Norway, with the first of six Moy Estuary sea trout she landed with seven casts. 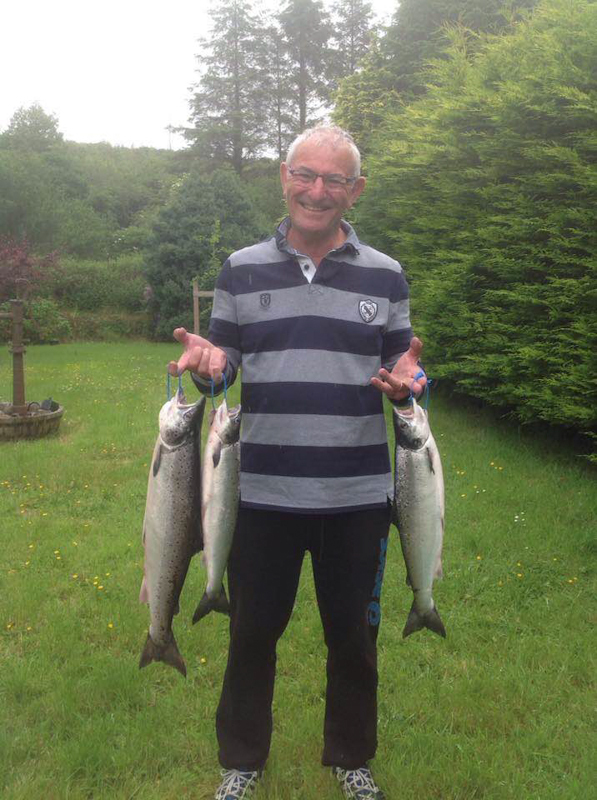 Luke O'Connell reported that the Falls at Ballisodare were still fishing very well with 102 salmon caught for the week even with very low water! Thirty-three of the fish were caught on the fly, while 65 were taken on the worm and prawn. This was the first week the fish steadily took the prawn. Monday June 6th - 11 fish caught for the day all on worm and prawn. Juvenile angler, Luke Colgan, had a fish of 4 lbs. on the prawn, Brian Hanratty had 2 fish on the worm both of about 4 lbs., Tony Smith caught a 4 lbs. grilse on the prawn. Visiting German anglers, Willy Martin and Stephan Michael, had a good day catching 2 grilse each; Willy had 2 on the prawn weighing 4 lbs. and 6 lbs., while Stephan had 2 fish on the worm weighing 3 lbs. and 4 lbs. Tuesday June 7th - Alfie Mahon had 2 lovely fish weighing 8 lbs. and 9 lbs. on the worm, Jim Kennedy landed 2 fish weighing 4 lbs. and 5 lbs. on the worm, Jim Keenan also had two on the worm weighing 4 lbs. each, Stephen Cassols caught a 3 lbs. grilse on the worm. Eddie Harte released 2 fish on the fly weighing 3 lbs. and 4 lbs. and then caught a nice six pounder all skating a small tube fly. Visitor, Alan McMaster, released two 4 lbs. fish on the fly, the fish took a Lady Etna. Wednesday June 8th - Leslie Cooper caught a lovely seven pounder on the worm. Dermot Glennon released 2 on the prawn about 5 lbs. each, Vincent Henry released 2 on the fly of about 3 lbs. and 4 lbs., while John Connolly also released 2 fish on the fly weighing 4 lbs. and 5 lbs. Thursday June 9th - A good day was had on Thursday with 22 fish caught, 12 of which were released. Eamon Ruddy had two nice fish on the worm weighing 5 lbs. and 7 lbs., John Connolly had a fine 7 lbs. salmon on a Cascade, while Frank Adams landed a lovely eight pounder on the worm. The other fish averaged 4lbs. and were caught on fly and prawn. Friday June 10th - Friday was another good day at the Falls with 25 fish caught, 12 of which were released. The fish averaged 4 lbs., mainly caught on the fly, with a couple on the prawn and worm. JB Chenaux had a nice 6 lbs. fish on the prawn after releasing 2 and missing several more. John Connolly and James McGuire both released nice fish of approx. 6lbs. Saturday June 11th - 13 fish were caught on Saturday, three of which were caught on the worm, the rest were on fly and prawn with 6 fish being released. Best fish of the day went to David Lee, a lovely fish of approx. 8 lbs. taken on the fly. The rest of the fish averaged 4 lbs. Sunday June 12th - 19 fish were caught on Sunday mainly on fly and worm with 4 taken on the prawn. Most fish were around the 5 lbs. mark but John Moriarty had a lovely fish of approx. 10 lbs. on the worm. In the low water and higher temperatures a small plastic tube skated across the water or fished just slightly sub-surface on a floating line with a long leader has been working along with small Cascades, Stoat Tails and darker/more traditional patterns. The Interpub Team Event and Paddy Gavin Memorial Sea Angling Competitions, took place on Sunday 5th of June and were hosted by Newport Sea Angling Club. This was the club's first competition of the year and the excellent weather conditions played a major role in making the day an enjoyable event. The tea & sausages in the morning went down a treat before the 5 boats departed for the fishing grounds. All anglers were automatically entered into the two events and all anglers enjoyed a good day's fishing. As always, the club's trophy officers had put together a fine array of great prizes and the presentation took place at the Grainne Uaille which were last year's local pub team winners. The 2016 Interpub Competition winning Team was The Village Inn, Kilalla which won the €300 cash prize sponsored jointly by Comfort Solutions (Fergus MacManammon) and Charles Murray Tyres, Westport Road, Newport. Congratulations to all winners on the day and thanks to all who took part. The club would also like to thank the Gavin Family as main sponsors of the Paddy Gavin Memorial Competition. Thanks also go to Harry & Liz from the Grainne Uaille who sponsored the food during the presentation and Boris for supplying the rolls for the breakfast! The overall winner of the Paddy Gavin Memorial competition was Owen Joyce with a total of 28 fish and 160 points. Runner up was Padraig Munnelly, in 3rd place was David Moran. Fourth place went to John Munnelly, 5th was Paul Murphy and in 6th place was Neil Harrison. In the Junior section the overall winner was Jessica Loftus with 31 fish and 185 points, 2nd place went to Clodagh Moran and in 3rd place was Roisin Moran. Conan McHugh won the Novice Junior category with Jack O'Grady finishing in 2nd place. David Moran won the largest bullhuss of the day prize with a fine fish measuring 38", while Jessica Loftus won the largest ray measuring 21". David Moran pictured with a 38" bullhuss which won a prize for the largest fish on the day. The 2016 Interpub Competition overall winning Team was The Village Inn, Killala, (Padraig Munnelly, John Munnelly, Peter Coyne & Paul Murphy) with a total of 82 fish & 470 points. Runners up were RBM Fisheries Team 2, Westport - (Garry Moogan, Neil Harrison, Mark Sheridan, Tommy Durcan) - 61 fish, 365 points. Best local Pub was The Bridge Inn, Newport - (Pat Moran, David Moran, Charlie Murray, Mark Walsh) - 48 fish, 280 points. 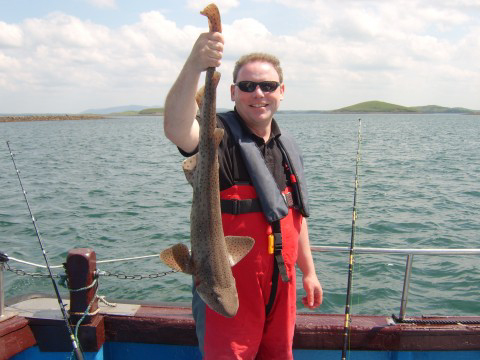 Boatman of the day went to Niall O'Boyle who skippered the Inishoo. The club would like to thank all of the sponsors, those who helped organise the event, the skippers and all who took part on the day. The next Newport SAC event will be an all juniors competition scheduled for Sunday 3rd July. For bookings contact Sue on 086- 3862568 or any member of the committee. More details are available on the club's website: www.newportseaanglingclub.com.